Kathryn Gross, Project Director for Never Alone in Detroit, has over 30 years of experience in education. She teaches at Loyola High School in Detroit, and is an adjunct professor at the University of Detroit Mercy. Developing curriculum and support systems for underserved populations in the City of Detroit, she continuously finds herself amazed by the gifts and talents of the students she meets. 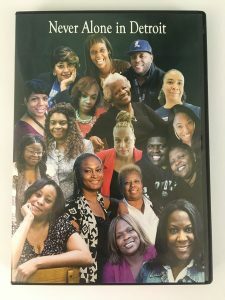 Her project, funded in part by a Heritage Grant from MH, resulted in a 40-minute documentary featuring the voices of mothers raising young men in poverty in Detroit. In this post, Kathryn discusses the experience of interviewing women for the film. Applying for MH’s Heritage Grant inspired us to delve further into the stories and find the human element underneath the statistics. Each story opened our hearts and tore away at walls of preconceived expectations. The process developed quickly. Although we often faced challenges in obtaining quality due to technical problems involving audio, and the limited availability of the women we interviewed resulted in many more sessions than originally planned, each story we heard motivated us to do more and awakened a desire to hear more.